Mary Weber lives and ministers in Indianapolis, In. She was ordained a priest in July 2014. Mary served the Church as a Pastoral Associate, a Retreat Facilitator and a Nursing Home/Hospital minister for over 45 years. 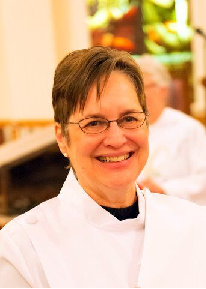 Currently she serves as a volunteer nursing home chaplain and a House Church Leader. As a wife, mother and grandmother, Mary is passionate about lifelong learning, the arts, walking with those who have experienced loss and empowering women. Youth ministry, social work, hospital administration and owning a sales rep company were her professions. Mary is in awe of ARCWP where Sophia serves the marginalized and disenfranchised.